The Internet is currently a basic need of millions of humans all around the world. If we reel down the flashback of its original history, we come to know that it’s started to get recognition globally back in the early 1990s. The basic formula behind the internet is a global wide connection between millions of computers and servers connected together and sharing data all simultaneously. It connects education, government, commercial and business institutions across all seven continents of the world in over 150 countries, making our world given a nickname “global village”. Years to come and the number of users steadily increased. Consequently, millions of new users join the internet annually. With the internet’s continuous development and advancement, it became cheaper and faster with every passing interval. It later allocated into two forms. Part of it was through cable and another part was used wirelessly. However, the quest to attain faster internet is still underway and we are continuously getting a faster and better connection. First, it was the reign of the dial-up connection, it was then superseded by the dynasty of fast version ‘DSL’ technology. Now in the era of cable internet, it’s time for even more reliable, latency-less and high-speed connection than ever before. The Spectrum Internet provided by Spectrum (formerly known as Charter Spectrum). It is an association of VoIP and internet technology. This article is devoted to learning, how to use Spectrum internet and cable service effectively in your home and get most out of it. 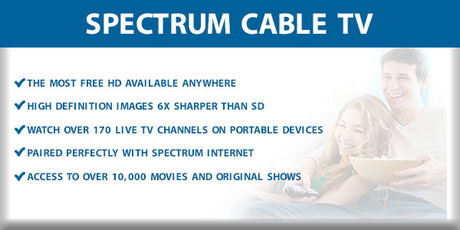 Spectrum is a brand powered by Charter Communications. It was born from its maternal companies Time Warner Cable (TWC) and Bright House Networks which were acquired by Charter Communication in 2016. Currently, spectrum has a number of services under its identity like internet services, Cable TV, phone, Latino and business solutions for networking from its officially designated attractive bundles. The spectrum covers almost all the regions across the United States and with good approval rates from users for its cheap price and trustworthy speed between 60Mbps to 100Mbps; it defeats its other rival providers. Spectrum internet and Spectrum Cable TV deserve an honest shoutout, which is covered in rest of this article. Spectrum pledges to offer its quality service to all of its valued customers. We will go get a brief sneak peek at all of its services. From now on, you don’t have to miss out your favorite night comedy show, or your favorite Common Wealth Games, or Annual Arena of State of Origin, or FIFA World Cup or the Olympic games as a sports mania or your favorite latest TV series or Movies, or kids channels like cartoon networks, Disney XD. Because Spectrum Cable has brought you the best option, which covers your need with the Spectrum list of more than 2000 TV channels. Spectrum promises to offer three TV plans; Select, Silver, and Gold. Spectrum assures its clients to provide a high-speed internet with a minimum of 60 Mbps speed and a high-end speed reaching up to 100 Mbps. Moreover, there is no hidden data cap or limitation to stop you from downloading, surfing, buffering or gaming online. Spectrum doesn’t require a huge paper-work or contract to start giving you a connection. It will also offer you with free perks like built-in anti-virus, anti-spam and hacker protection. If you have kids at home and you want a parental control feature. Spectrum has your back covered in that too. It will also dedicate you a complimentary Internet modem. You can pay extra 5 bucks to get Wi-Fi enabled the modem to share with connection with your family or by your own router with Wi-Fi to save some extra bucks. Spectrum Phone service promises to provide you high-quality voice calls, with unlimited nationwide calling with lower monthly charges, the voice package also includes all the necessary features including voicemail for free. These features are; Caller ID, VIP ringing, blocking the unwanted calls, 3-way calling, caller ID and readable voicemail. If you want to save some money and want multiple functions in one purchase, then Spectrum has some good deals to choose from. Spectrum triple play: This bundle has two sub-options like TV SELECT + Internet PLUS or TV SILVER + Spectrum Voice. Every internet works on the basic purpose of surfing, streaming or downloading but how charter internet deals work in our favor? We will unlock the Pandora box and unravel some strings see what makes it stand out from the type of cable internet connection. The most important thing that a player has to keep in mind while choosing the Internet is a virtually lag-free connection. Modern game upholds well up to 100 m/s pings. Speed test of the charter spectrum shows ping result between 10 m/s to 70 m/s. This makes the Spectrum Internet your ideal partner in the smooth gaming experience. Either you are a PC gamer or a team leader of your RPG guild that needs your fast responsive action e.g. League of Legends, Overwatch etc. or console gamers like Xbox and Sony PS4, Spectrum is well up to the task. You can connect your spectrum receiver provided by spectrum cable service agent to your HDTV with HDMI cable and enjoy official TV channels of all criteria. It makes a variety of channels with all kinds of genres. Grab the popcorn and enjoy the 2000 pre-listed TV channels with your family. Downloading and uploading are the main thing for the internet user. If your bandwidth is good enough, then you will download large files in the very short amount of time. The best the speed is, the quicker you will finish your downloading and vice versa. Spectrum internet ‘nailed it’ with its one of the fastest proven internet speed, giving 60 Mbps as a minimum speed and goes up to 100 Mbps maximum depending on your region, Spectrum internet deal, or you are within the near vicinity of hub location. YouTube or any other streaming sites are part of our everyday life and it is very frustrating if video stops halfway while watching or take time to get back on the track. Spectrum internet provides you more than enough speed for non-interrupted streaming, downloading and playing games simultaneously on one connection. The modem that is given gratis by Spectrum has no Wi-Fi support, to get Wi-Fi you need to pay extra 5$ per month or buy your own router to save some bucks. One thing is s certain; you can avoid costly mobile internet packages. Connect your portable smartphone through your Spectrum Internet modem and save prepaid or postpaid bill chargers on your mobile of internet usage.